When it comes to TV, movies, games, apps, and general screen time for your little one, how much is OK, what kind is best, and when do you introduce everything? If you’re one of the many new parents who are confused and worried about screen media, take heart. Much of what you’ve probably heard — that any screen time is bad — isn’t supported by research. That said, what’s best for babies — interactions with loving caregivers, the ability to explore their worlds, and exposure to language — can’t be replaced by a screen. As with most things, the answers lie somewhere in the middle. Here’s the definitive guide to managing movies, TV, the Internet, apps, games, and more. 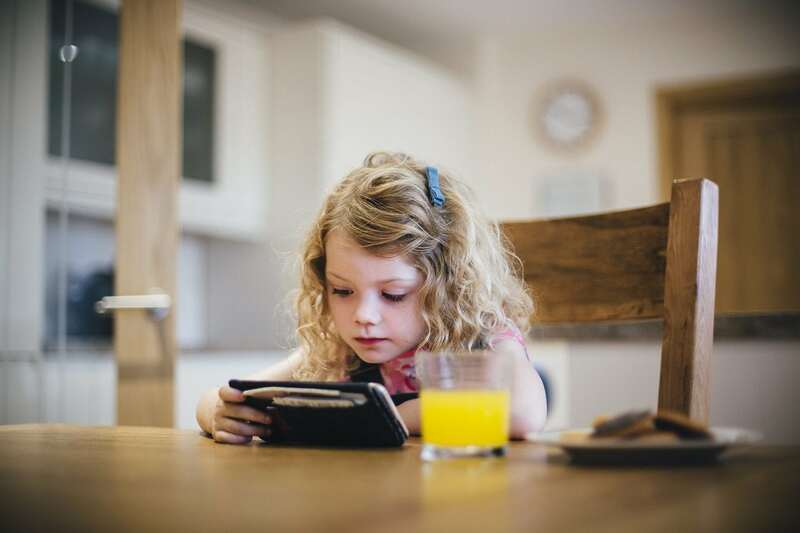 Some parents worry that exposing their kids to any TV or screen time could be damaging. Take it from us; a little bit of media isn’t gonna hurt. We simply encourage parents to limit time with screen media for kids under 2 or to use media as a means of furthering and cementing your relationship with them. The most important thing is that time spent with screens don’t replace time spent with their loving caregiver. Try the ideas below in small amounts — say, 15 or 30 minutes. Video-chatting with a grandparent is a great way to build cross-generational relationships or bond with a relative who’s away. If you’re counting screen-time minutes, video-chatting should be excluded. It’s really no different from talking to a family member on the phone (and it’s actually easier to involve babies and toddlers since they can respond to facial expressions better than verbal language alone). Is it OK to keep the TV on when I’m with my baby? This is risky. Role modeling healthy media habits is important. So-called “background TV” can lead to fewer interactions with your child and less conversation, both of which have real impact on kids’ development. The images and tone of what’s on the screen are problematic, too. Infants sense emotions and experiences in a very real way, whether from their mothers or from actors on the screen. If you need to keep the TV on, mute the commercials, avoid mature content, and make an effort to talk and play with baby as much as possible. My baby has a tantrum if I don’t let her use my iPhone for screen time. Respond as you would for any other tantrum and use your normal consequences. If handing over the phone has become a habit, it’ll take some time to curb her outbursts. Transition into using the phone together — such as showing her photos of herself or watching short videos together — so she’ll get used to it being a shared experience. And begin to show her how you use the phone as a tool — not a treat. As with everything else she wants and can’t have, she’ll develop the ability to self-soothe with your help. At some point, she’ll understand “Mama’s phone” and can learn how to ask for it politely. My baby loves screen time to watch short videos of kittens and puppies online. Is that OK? If you’re enjoying them together and keeping your viewing sessions fairly limited (those videos tend to draw you in for longer than planned), it sounds just fine. Your baby is enjoying the closeness with you as much as the videos. First, consider whether she has the attention span to watch a full show. Many series designed for the youngest viewers break shows into 10- or 15-minute segments. Start with a single segment of a show and see how engaged she is. If she’s riveted, you can try a 30-minute show. You have literally thousands of options. Find a subject she likes, determine a limit (one show, two shows? ), and watch together if you can. Many half-hour shows, such as Daniel Tiger’s Neighborhood, actually contain several shorter segments you can start with. Do what you can to limit commercial exposure — kids absorb those messages like a sponge. If I’m restricting screen media, what can I do to occupy my kid while I take a break? Listen to music.Young kids love to shake, shake, shake to all kinds of beats and sounds. Encourage kids to move and shake to the music and to make sounds themselves. Have them “read” books.Just the act of holding books and flipping pages can prime kids for a future love of reading. They can pretend they’re reading to a stuffed animal. Play audiobooks.The act of hearing helps with language acquisition, imagination, and critical listening skills. Set up a comfy space where your child can play with blocks or dolls while listening to an age-appropriate story. If you want to give the theater a try, sit in the quietest seat and be prepared to leave if things take a bad turn. You might be lucky enough to live near one of those theaters designed for families, or your local theater might host a mom-and-dad’s night where they turn the sound down and the lights up to make it more baby-friendly. Should I limit my phone use when I’m with baby? You may be craving adult conversation and connection — or maybe you need to work from home while watching the baby. The most important thing is to make sure you’re keeping an eye on him; there have been instances of kids hurting themselves because their parents were distracted by their phones. Young kids learn best through nurturing relationships with caregivers and loved ones, so make sure your phone use doesn’t interfere. Talk, play, hug, and make eye contact with infants as much as possible. Use screens in service of relationship-building (showing a photo of grandma) or to occupy yourself while the baby is sleeping on top of you. Sometimes bending your own rules for the benefit of social harmony is the way to go, but only you can make that call. Tell the parents that your kid is frightened by scary stuff and that you have a particular “thing” about him watching shows or playing games with potentially frightening images. How close of an eye do the other parents keep on the kids — especially when the kids are on the Internet? Ask if they have content filters installed on their search engines. Multiplayer games.Find out if the other kids in the house play multiplayer games. If your kid isn’t familiar with them, ask if multiplayer can be turned off until he gets the hang of the game. Make sure to talk to your kid about playing online games responsibly and respectfully. Tech-free zones.Keep family and social gatherings tech-free. Recharge devices overnight — outside your kid’s bedroom to help them avoid the temptation to use them when they should be sleeping. These changes encourage more family time, healthier eating habits, and better sleep, all critical for kid’s wellness.